Nicolas Bentley was a man of many parts—publisher, circus clown, film extra, novelist, mimic, journalist, fireman, poet, ad man, and commercial artist. The godson of G.K. Chesterton, he became one of Britain’s best-loved humorous cartoonists and caricaturists. 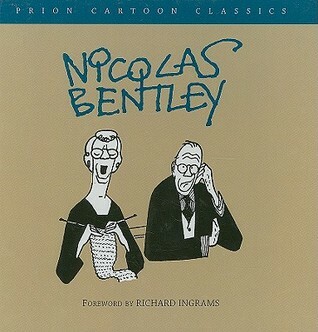 Among the seventy-odd books that still carry the immortal by-line “Nicolas Bentley Drew the Pictures” are works byNicolas Bentley was a man of many parts—publisher, circus clown, film extra, novelist, mimic, journalist, fireman, poet, ad man, and commercial artist. The godson of G.K. Chesterton, he became one of Britain’s best-loved humorous cartoonists and caricaturists. Among the seventy-odd books that still carry the immortal by-line “Nicolas Bentley Drew the Pictures” are works by Hilaire Belloc, Damon Runyon, Lawrence Durrell, Kingsley Amis, and most famously, T.S. Eliot’s Old Possum’s Book of Practical Cats. Here, assembled for the first time in one volume, are nearly 200 of his finest joke drawings.